Downton Abbey 3:2: Is the Abbey a Bourdieu habitus? 2) fuel conflicts as some of the characters’ whole being is bound up with keeping what they can of the left-over ancien regime order of the pre WW! world (e.g., Lady Mary [Michelle Dockery], Carson [Jim Carter], Lord Grantham, Violet, the dowager [Maggie Smith]), while others want out (Matthew, Lady Sybil now Mrs Bransom [Deborah Findlay-Brown]), see it as punishing, excluding, cheating, pressuring them (Daisy Robinson [Sophia McShera], Tom Bransom [Allen Leech], Sarah Obrien), see what’s happening and don’t care as long as they can get what they want out of what’s to be (Lady Edith [Laura Carmichael], Mrs Hughes [Phyllis Logan], Anna Bates [Joanne Froggart]) or just knuckle under (Cora, Lady Grantham [Elizabeth McGovern]; Anthony Strallan [Robert Bathurst]). This quite apart from how we are to view them ethically. The richness of the series — what makes it compelling is the way these complexities are made to play out in the dramatic scenes and manifest in witty dialogue. Part Two shows the need of a third season to be fresh while keeping the community going. The world of Downton lost characters in the previous years to war (which itself provided much of the narrative thrust and events of the second year) or life’s attrition (Gwen Dawson got an office job, Sir Richard Carlisle [Iain Glenn] couldn’t integrate). So you need new characters or you bring a strong character back. In the aesthetics of soap opera characters may drift out of range and then drift back again. Penelope Wilton as Isobel Crawley is still half-thwarted in her function as the program’s proofs that liberal solutions will not work. (Again Fellows’ politics is ceaselessly in evidence.) Mrs Crawley has now opened a clinic and employment agency for young women who have become outcasts. This allows Fellows to bring back Ethel whose rebellious spirits and burning desires will no doubt overcome her shame and unwillingness to kow-tow (compromise) to authority and conventional norms. Those of us who did watch last season know she had a small son and he needs to be accounted for. And thus we are hooked into next week. This need to make the material compelling again may also be seen in Part Two where the idea seems to be to throw wrenches into our assessments and expectations. There is a real attempt to make us suspect that after all maybe Bates did murder his wife. Brendan Coyle is presented as a seethingly dangerous, menacing John Bates when Anna Bates is not around. The partnership of Thomas and Miss Obrien breaks down. Uncertainty replaces or is added to unease as part of the dominating mood. The Bransoms have gone home to a difficult life in Ireland. Will Lady Mary and Matthew really make it as a couple? Until near the end of the part, will Shirley Maclaine as Mrs Leveson again supply an enormous amount of money to keep this luxurious hierarchical life going for this privileged group of people? Mrs Hughes: You just missed an admirer. Mr Carson said you did very well. Mrs Patmore: Did you tell him? Mrs Hughes. No. And what is there to tell? One day I will die and so will he and you and everyone of us under this roof. You must put these things in proportion Mrs Patmore, and I think I can do that now. 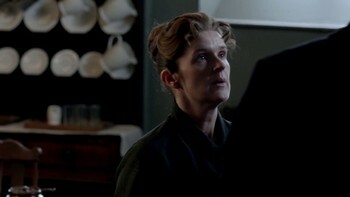 Mrs Patmore puts out her hand and touches Mrs Hughes’s arms and walks off the stage. Ironically what is certain in this series so far has been death. For my part in Part One for me the most moving character was Mrs Patmore: it was when Anna left her alone to have her eye operation and she looked so anxious that I burst into tears. In Part Two I bonded with Mrs Hughes’s moral strength and loyalty when she helped Ethel and her Scots sceptical stoicism. When the character who I originally hated as a misogynistic fantasy and has now emerged as one of my favorites (I’ve grown to love her), Miss Obrien, tries to pressure Mrs Hughes into conforming with the rest of the kitchen and at least pretending to believe in an afterlife, ghosts, spirits,” Mrs Hughes replies: “Yes but I do not believe they play boardgames.” I now see Miss Obrien as a stand-in for the old deprived-governess character (always in sober clothes, not made up), single, perhaps unaware of her lesbian impulses (especially towards her lady as we saw when Cora became mortally ill). As there is a resort to switching or casting doubt on our expectations, so the primal generic feature of soap opera is allowed to emerge: female desire. It’s powerful. What are these two episodes about, but women getting married? We have the iconic scene of the bride, the outfit, the walk down the aisle. The high point (or low depending on who you concentrate on) of the previous part when Anthony Stallan exposed the lout-lord (it’s curious how young high lords in this series have often been louts) Larry Grey [Charlie Anson], but now in this episode we think we are having a repeat of the thwarted romance that happened to Edith (with a crippled man who was an imposter) in the second season. Lord Grantham tries to break up Edith’s romance; he refuses to reward Stallon, and implicitly it’s his not being a macho male (the bad arm is the sign of this). AT the center we have this poignant moment when Edith begs her father to let her have what she really wants and is backed strongly by Mrs Leveson (one of her best moments). 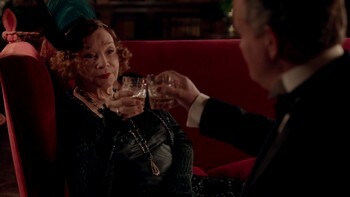 to Miss Obrien goinng about trying to help Alfred when she gives Thomas a strong comeuppance by having the nerve to steal all his Lordship’s fancy shirts and putting them in a trash burner: Thomas’s fooling Alfred into burning a small spot on Matthew’s dinner jacket is petty stuff to this. Her intense desire to help her nephew shows her mother instinct. And she has all along existed on the other end of a spectrum to where the Dowager looks at the world, her sceptical wit is as good as Maggie Smith’s and she delivers her lines equally deadpan. The palette of this part is dark, dark colors, a lack of light, downstairs and the prison are more frequently seen than upstairs which is itself often night-time. Mrs Leveson: You know the way to deal with the world today is not to ignore it. If you do, you’ll just get hurt. Lord Grantham: Sometimes I feel like a creature in the wild whose natural habitat is gradually being destroyed. Mrs Leveson: Some animals adapt to new surroundings. It seems a better choice than extinction. Lord Grantham: I don’t think it is a choice. I think it’s what’s in you. Mrs Leveson: Well, let’s hope what’s in you will carry you through these times to a safer shore. And they drink to it. Is it too much to see Downton Abbey as a habitus in Bourdieu’s sense: where we see dramatized from a woman’s perspective and art (the soap opera) “the lifestyle, the values, the dispositions and expectation of particular social groups that are acquired through the activities and experiences of everyday life.” As long as we read against the grain Fellows’s persistent reactionary lessons, which the dramatic form and characters provide much undermining of, I think it is.